I always try to visit a pub I haven't been to before when in Liverpool. But I'm really starting to struggle these days. 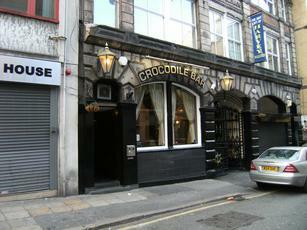 The Crocodile was my new pub on yesterday's visit. It's tucked away on a side street only yards away from the Cavern Quarter and the city's main shopping area. But despite its location, it was fairly quiet. The interior is large and dark with the room stretching back a fair way. The décor is very traditional and service was friendly. There are no real ales here. The keg range was Tetleys Smooth & Mild, Guinness, Carling, Strongbow, San Miguel & Tuborg. There is a bar called Baby Croc just across the courtyard that seems more of a late night venue. But this pub was surprisingly better than I had expected. Liverpool pubs still have the knack of surprising me now and then. Always a good place to watch the match on the foreign channels, as mattbeer points out, pleasant atmosphere, barstaff and customers alike always friendly. Not a bad place at all. Went in here a few weeks ago for the first time to escape the rain. Was pleasantly suprised. No real ales but great atmosphere. Have been back several times since and they show the footy on TV. It's a narrow but very long pub. Outside is a courtyard with plenty of seating and also an external TV so the smokers can enjoy the sports too. On the other side of the courtyard is the smaller Baby Croc bar. Went in there once and it's less hectic but they also have plenty of TV's showing sports. Not bad for a pub in a narrow street in the centre of Liverpool that you wouldn't know about unless you are lost! It's right by Mathew Street and the Cavern too so is handy for all of the other pubs and bars in the Cavern Quarter.